Russian lacquer art is renowned all over the world for its beauty and vivid colours. The collapse of Imperial Russia brought with it the downfall of “icon painting” and thus emerged a new form of art known as “lacquer art”. The icon painters suddenly found themselves jobless and in order to make a living for themselves and their families, they resorted to making papier-mache products and lacquered items. The oldest centre for Russian lacquer art is in a village called “Fedoskino”. Since 1795, the art of Russian lacquer miniature painting has been done on papier-mache. The unique element of these paintings is that they use oil paints and not egg tempera. The paintings are quite realistic in their interpretation and are impressionist. They have short and thin brush strokes and depict the passage of time, changes in life, perceptions, and human feelings with subtle shades of light. “Palekh” is another renowned centre for Russian lacquer art. Palekh miniature is done on varnished articles made of papier-mache using egg tempera paints. 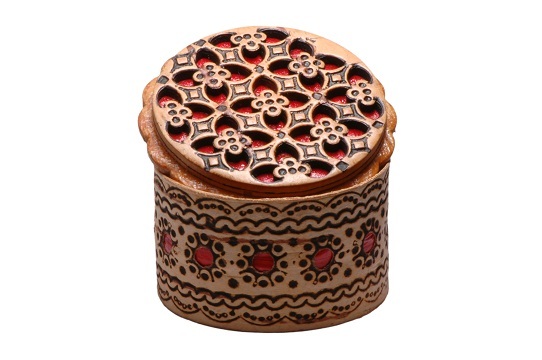 Small boxes, powder cases, cigarette cases etc are the most common items made from Palekh Russian lacquer art. “Kholuy” is also a renowned centre for Russian lacquer art. Just like Palekh art, Kholuy lacquer art is also made on varnished items made of papier-mache using egg tempera colours. This art is exclusively produced by the students of Kholuy School of Icon Painting that was formed in the year 1883. Compared to the other lacquer art centres, Kholuy miniatures are less restricted by tradition. “Mystora” miniature lacquer art is done using egg tempera paints on varnished items that are generally made of papier-mache. These miniatures are depictions of real life characters, historical events, folklore and literary events. Usage of soft shades, dark blue and black landscaped backgrounds, squat human forms and framing pattern in gold are some typical features of this art. Barring Fedoskino, the other three centres of lacquer art in Russia use egg tempera for their art. Russian lacquer art has its roots deeply embedded in the 17th century icon painting tradition. Only those boxes bearing the original signature of the artist from any of the above mentioned four villages are considered to be authentic antique Russian lacquer boxes. The price of the boxes can vary as per their artist and the art displayed on the box. You can also find imitation Russian lacquer art pieces in the market that are good gifting items and come at quite reasonable prices too.